I was a little surprised to see 2016 updates to the BOB Revolution Flex and Pro models since they have been just released last year. I think BOB should’ve waited a little and included all of the updates this year instead of releasing a new version two years in the row. This creates a lot of confusion. Let me start by saying that Flex and Pro models is an upgrade to the beloved Revolution SE. The 2015 upgrade was only in the adjustable handle bar and an added hand brake to the Pro model. That’s it! For 2016 we have a lot more stuff like: easier recline system, more upright seat, larger basket, improved brake system, higher weight capacity of 75 lbs, new frame design, improved quick-release of the front and back wheels, and new colors. Because of the new frame design the weight of the Flex model has also increased from 26.2 lbs to 28.5 lbs. Both Pro and Flex models feature a large canopy, large air-filled tires, state of the art adjustable suspension system, adjustable front wheel tracking, adjustable handle bar, additional storage, and easy fold. It can also be converted into a travel system with an infant car seat adapter. The good thing is that it works with the most popular car seats. I gave it 5 out of 5 stars despite the extra weight because I really like the 2016 updates especially the updated recline and the upright seat. I get many emails from parents who are looking for a stroller with an upright seat. So this is a big one. In my opinion BOB Revolution Flex and Pro are by far the BEST joggers on the market right now. This is a perfect choice for sporty parents. The only thing I wish it had as an available accessory is a bumper bar, but you can purchase a snack tray instead. The RSVP price for Revolution Flex is $499, but you can get it on Amazon for around $450. It comes in three colors, but there are no accessories included. I would like to see a cup holder and a tire pump included. -HUGE canopy. It has a large two-panel canopy that goes all the way down providing a full coverage. This is one of the best jogger canopies on the market. There is also a large plastic peekaboo window with a Velcro closure. For the next update I would like to see a magnetic closure instead. -Adjustable handle bar. The 2016 model also has an adjustable handle bar that offers 9 different positions to choose from. It goes from 34″ up to 45″ from the ground. The handle bar is nicely padded with a foam. -Wrist strap. The runaway strap is attached to the handle bar providing extra security in case the stroller runs away from you during jogging. -Roomy seat. The seat is 14.7″ wide and 23″ high from the bottom of the seat to the top of the canopy. The nice padding of the seat will provide your child with maximum comfort and support. The material is very durable and is easy to wash. It has a deep recline that goes to almost flat position. For 2016 the recline has been improved. Now you can recline the seat with just one hand instead of using both hands to adjust straps on each side. You will still need to use both hands to bring the seat back up, but it’s much easier now. All you need to do is pull on the straps and it will go up. The seat can now accommodate a child from 6 months and up to 75 lbs (till college. LOL). Before it was only 70 lbs. Of course I wouldn’t recommend jogging with a baby till he is at least 9 months old. If you want to put your baby into the seat, I would suggest using an infant insert. 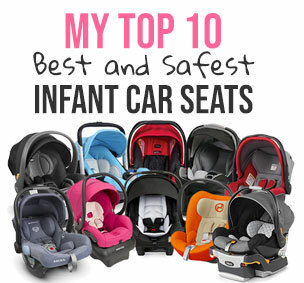 This Summer Infant insert is perfect of an infant car seat or a stroller. It provides additional support so your baby will be comfortable and safe. -Seat storage pockets. There are two mesh pockets inside of the seat that I find very useful. You can store toys, snacks of a sippy cup for you child. -5 point harness. Like most strollers these days, it has an adjustable 5 point harness. The cool thing is that to adjust the harness you don’t need to re-thread it. The padding is very sick and comfy. The only thing I am not crazy about is the center release buckle that is very easy to unlock. Your toddler might jump off the stroller while you are walking. -Large basket. The basket has been redesigned. Now, it is larger and sits a little lower to the ground so you can fit more stuff. Since most joggers have small baskets, this is a big plus. It will definitely fit your large diaper bag. It’s also very easy to access from the back and the sides. -Large wheels. It rolls on three air-filled tires with 12″ wheel in the front and 16″ wheels in the back. The wheels are made out of high-impact polymer material. You will can easily take this one off road with no problems. Great for going to the park, beach, or just tackling snowy street. The front wheels are swivel, but can be locked straight for rougher terrain. Since these wheels are air-filled you will need to get a tire pump. -Adjustable suspension system. This suspension system is truly the STATE-OF-THE-ART! This is the kind of suspension system you only get on a jogger. You can adjust it depending on the terrain. The ride will be supper smooth. -Foot brake. The parking brake is located between rear wheels and will lock both of the wheels in place. It has been updated a little to be a little more flip-flop-friendlier, but still not completely flip-flop-friendly. I not sure why they didn’t take an extra step and didn’t make it flip-flop-friendly. -Easy fold. The fold stayed the same and there is still no automatic lock nor standing fold. It’s a two step process and that requires both hands, but it is easy to fold and unfold. After folding, you need to use a clip to lock the stroller in place. It also, does not stand on its own once folded. The folded dimensions are 39″L x 25.5″W x 16″H. It is not a compact stroller at all. To make it more compact, you can easily take off the rear wheels. -Bulky. Like most joggers Flex takes up a lot of space in the trunk. There is really nothing you can do. To make it more compact you can remove the wheels, but that is about it. -No cup holder. I would like to get a cup holder or a water bottle holder because I can imagine that most parents have a bottle of water while they are jogging. Here is a video overview of Revolution Flex 2016. Higher weight limit of 75 lbs. The weight limit used to be 70 lbs, but now it’s 75 lbs. This should last you till college. Haha! Larger basket. The basket is sitting a little lower now and is 15% larger than before. Quick release of the front wheel. The release is a two step now instead of one step before. More upright seat. Slightly angled seat position in the most uprigt position was one of the complaints from parents. As you know, kids like to sit up straight and look around. Simpler recline. The recline is still operated by a strap system, but now it requires only one hand to recline the seat instead of both hands. This is a very typical recline that is used on most strollers. I am not sure why BOB had two-hand strap recline on the original SE model. Frame redesign. The frame has more plastic instead of metal. Higher weight of 28.5 lbs. All these great updated increased the weight of the stroller form 25 lbs to 28.5 lbs. New colors. As always there are new colors. My favorite place to buy strollers and a lot of other baby items is Amazon. It usually has the lowest prices, free shipping, free returns and no sales tax. How great is that? The US MSRP for BOB Revolution Flex 2016 is $499.99, but I found it on Amazon for around $450 (free shipping/free returns and no sales tax). Since these wheels are air-filled you will need to get a tire pump. Hello – I am trying to decide between the Bob Revolution Flex and Bumbleride Indie. I am not a runner and don’t see myself becoming one. Best case is I light jog on paved roads. The stroller would mainly be used for walks on paved roads, some trails and the beach occasionally. Which would you recommend? I prefer the aesthetics of the Indie but don’t want that to be the deciding factor. My main concern is the weight of the Bob, it will primarily be left in our garage but the grandmothers would use it for neighborhood walks. Also we have a Cruz for our car/shopping stroller. Thank you! Hi! Can you do a review of the Thule Urban Glide 1 jogging stroller or possibly compared it to the BOB Revolution Flex? It seems it is more compact than the BOB. Thanks! Hello just wondering about the newer 2016 Revolution Flex compared to the older model Revolution SE in quality? I read that they thought the quality of newer model wasn’t as good. I also noticed you said on the frame of the 2016 that there was a frame redesign and more plastic instead of metal. Seems like metal would be better than plastic? Hello, I also forgot to ask about accessories, which accessories from older models can still fit on the 2016 Revolution Flex? I have a peg perego car seat, and want to buy the adapter for the 2016 flex stroller and have had two different answers from Bob. One person said I could only buy the newest adapter for the 2016 Flex. Another person said I could use the adapter from 2011 to present and it would still work on the 2016 Flex. Not sure if you can help me out with what older accessories can still be used on the 2016 Revolution Flex. I’ve owned both the bob newer and older versions. And the bumbleride indie 2015. And I sold my indie it just didn’t handle and push and turn as smooth as the bob.